I can't have much in the way of dairy. And I don't like the chemically stuff in products like Coffee-Mate. I've tried the soy creamer from Trader Joe's, and it's not very rich and creamy, IMO. But I sometimes like a little creaminess to my coffee. Sooooo . . . This is what I've been making and using all summer. 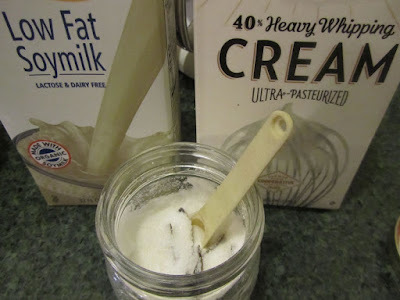 A concoction of heavy whipping cream, soy milk, vanilla sugar and a drop or two of vanilla extract. I cover and store in the fridge. 4 ounces of my reduced-dairy, vanilla coffee creamer costs me less than 35 cents. The local Cash & Carry carries 32-oz containers of Coffee-Mate French Vanilla Creamer for $4.00 (or 50 cents per 4 ounces). So, I'm coming out ahead, in cost, and enjoying a more natural product. Your savings would be dependent on the cost of your ingredients. With my lactose issues, I can't have milk at all, but I can have small amounts of heavy whipping cream. Heavy whipping cream has about half of the lactose of milk. So, when I use about 2 tablespoons of my less-dairy creamer, I'm getting the equivalent lactose of the amount in 3/4 of a teaspoon of milk. And I can just handle about that much at a time. I realize that I'm probably the only one, here, who happens to keep a half-gallon carton of heavy whipping cream hanging around in the fridge. I do have unique circumstances right now, which are benefitting from the use of heavy whipping cream. But if you're inclined towards buying those flavored coffee creamers, keep this in mind for just after Thanksgiving, when you do happen to have some heavy whipping cream leftover. A 4-oz batch of this will only take about 1 ounce of heavy whipping cream, to add to 3 ounces of milk (any kind of milk, not just non-dairy). This will keep, refrigerated, for about 5-7 days (the soy version seemed to last longer than the all-dairy). This sounds really good if I only drank coffee. While I love coffee, I think you are very fortunate to NOT love it. I tell my kids to not go down the caffeine path, if they can avoid it. None of them drink anything with caffeine at this point, with exception to the occasional cola soda (but not to wake up, or boost their energy). I use straight whipping cream in my coffee. :P And a bit of stevia. I have tried switching to half and half and can drink it that way, but the whipping cream makes it oh so good! And, in my defense, most days I only drink one cup so we're not talking just loads of whipping cream. If whipping cream was sold by the half gallon at the stores I frequent, I would have it in that size, for sure. As it is, I have two pints of heavy cream and 2 quarts of half and half (for husband and teenager) at any given time. Have you ever tried the Bullet Proof coffee, Lili? I am thinking it would be extremely low-lactose, but probably not nearly as cost efficient as your current mixture. It is delicious, though, and the only way I like coffee without sweetener. Straight whipping cream would be very low in lactose, too. 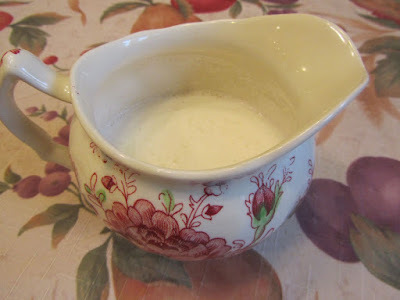 I use a creamer like my soy milk/whipping cream about 2 times per day. 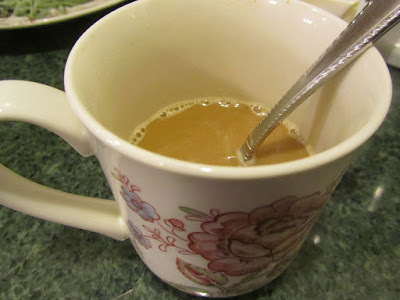 My first cup of coffee is always black, but later in the day I have a cup with vanilla creamer, as a sweet treat or dessert. It actually keeps me from eating other junk, so I figure that's a plus. In any case, I think whipping cream, half and half or soy/almond milk combined with whipping cream is a much healthier alternative to products like Coffee-Mate. And I am really trying to eliminate as many unnatural products from our diet as possible, as I know you do too. I am partial to straight half and half or (luxury!) heavy cream in my coffee. I find that the milk sugar sweetens the coffee enough that I don't need to add any additional sugar. But. I've been wanting to figure something out for those times when I run out of half and half before I have a grocery trip planned. Coffee is VERY important to me and lack of half and half is one thing that will send me to the grocery store regardless of whether or not I need any additional items. So far I haven't been very excited about the other things I've tried -- 1% milk in coffee mostly tastes sad, to me and I run into the same issues with the chemical/additives in powdered creamer. I'm at a bit of a stand still. I'm considering picking up a box of those shelf-stable single-serving creamer packs, although I hate the waste. But I like the idea of not rushing out for just one thing! I didn't realize that I'd meet so many people who like straight cream in their coffee! My dad always used milk. I could never get myself to like that, as it is so weak and pathetic (like you feel -- sad tasting). And plain soy milk was even worse. I was finding myself making the coffee super strong so I could fill half a mug with soy milk, just to get it decent. And soy creamer didn't seem much better. So, I've been very happy to keep the whipping cream around the house this summer, so I can enjoy it too! Hmmm, those individual cups of half and half could be a good thing for you. Especially if you just used them as back-up, but continued to buy your half and half by the carton, regularly. How about trying to freeze a small container of half and half overnight, just to see how it freezes and thaws? just try one small container, enough for one cup of coffee. At the very worst, you'd have one cup of coffee that you didn't care for. Dollar Tree sells these small plastic containers with lids that hold about 2-3 tablespoons, 10 for $1 in a pack. You could make your own individual half and half cups to freeze, then wash out the containers and reuse, if the quality of frozen then thawed half and half works for you. I just got 2 of these little containers from a church event over the weekend. They were filled with single-size portions of salad dressing. Everyone was throwing the empties out, but I managed to save 2 of them, with lids. They'll be great for packed lunches with things like sunflower seeds in them. This is totally off the subject of creamer - but indirectly ties in. You mentioned that you were able to salvage containers from a church dinner. It reminded me that Saturday night we were helping with a church dinner. They were putting canned pineapple out for a salad bar. They were just dumping out the juice so I took as many cans as possible to the other kitchen, found a plastic container that had been left many moons ago, and was able to drain the juice into it - and I came home with a couple quarts of pineapple juice. Interesting the things people give no thought about saving. Good for you, Ruthie!!!! I just can't stand to see that waste, either! In case you don't know, you can freeze any of the pineapple juice that you don't think you'll drink in the next few days. Meant to add, also -- pineapple juice (from cans of pineapple) mixed with orange juice, 50/50, is our "special" juice for Christmas Day breakfast. So, in fall I save any canned pineapple juice (from draining cans) I have in the freezer. Your homemade ranch dressing sounds yummy! And it doesn't have all of the chemical additives. I used to buy Italian turkey sausage, to use in spaghetti. But that got too expensive. So, I, too, have been planning on making my own Italian sausage. I have a package of ground turkey in the freezer, that I plan on turning into Italian sausage. I look forward to hearing what you add to the meat, Good luck!